Winemaker’s Notes: Aromas of cassis, plum and star anise complemented by cigar box and cocoa powder overtones. A rich, full entry on the palate gives way to savory dark fruit, rustic tannins and a lingering finish. 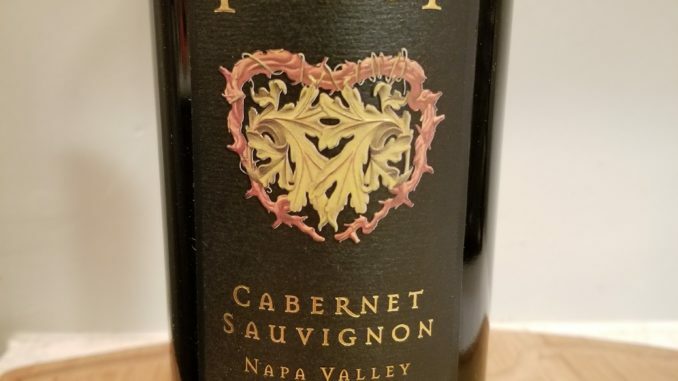 My Review: Every year or so I get to try the newest vintage of Faust Cabernet Sauvignon (the last time was two years ago for the 2012 vintage). They have yet to disappoint and to give you the quick review, the 2014 vintage doesn’t either. But I know – you want more. In the glass the wine was a brick red color with slashes of purple that showed when the light hit just right. On the nose I picked up dried fruits. I was impressed that the wine didn’t show hot on the nose given the slightly higher alcohol content (14.8% alc/volume), but that’s a testament to good grapes and winemaking. In the mouth the wine showed flavors of currant and dried fruit, softening in the mid-palate and leading into a juicier finish that carried through the notes from the beginning while adding a lushness that wasn’t found at first blush. My wife and I paired the 2014 Faust Cabernet with beef stew that had been cooking all day in a slow cooker, and the wine did a great job of pairing with the richness of the meal, the dried fruit aromas and flavors countering the dish, while the lushness on the finish paired well with the meat that had been cooking all day. The Faust wines routinely come in at around $50, and while I’ve waffled a bit over the years on the price, I can’t say that it’s not worth the price, which in many ways is an endorsement. If you’re looking for a special occasion wine you won’t be disappointed in this wine. Worth picking up.